Murići on Lake Skadar, Montenegro – 16/04/11 | Camperissimo! After an evening out on the booze with our new couchsurfing friend Marija, we woke up feeling fairly hung over. As per our routine, I woke up first and insisted that Iva wake up and come out for a walk with me. I am a firm believer in the philosophy of “walking off a hangover”. 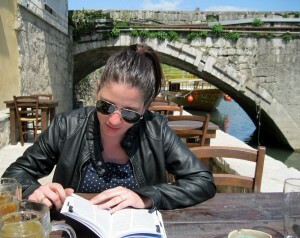 It’s on this basis that most of my knowledge of the streets and neighbourhoods of Munich was acquired. Feeling rough as a trucker’s underchin, we set off in a random direction. Somewhere along the way we stopped off at a tiny bakery, which it turned out sold three things: burek, soft drinks and cigarettes. I bought a burek, stuffed with cheese and quite possibly soaked overnight in engine grease. Iva bought a bottle of “green apple drink”, which turned out to contain 1% fresh apple juice and 99% green. 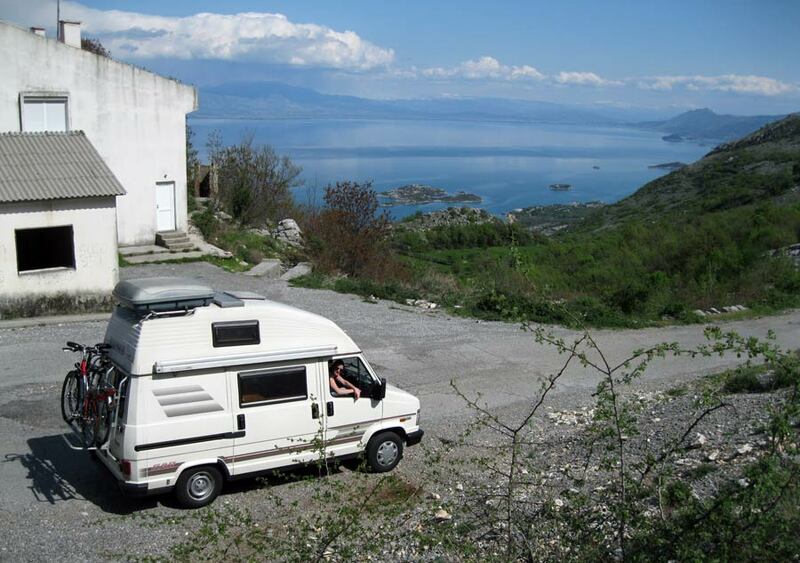 After a long walk around Podgorica, a visit to the dirtiest toilet I have ever seen and a bracing cup of coffee we ended up back at the van, just about straight enough to drive. Our plan was to drive along the south side of Skadar into Albania. Two thirds of the lake are in Montenegro, the rest across the border in Albania. 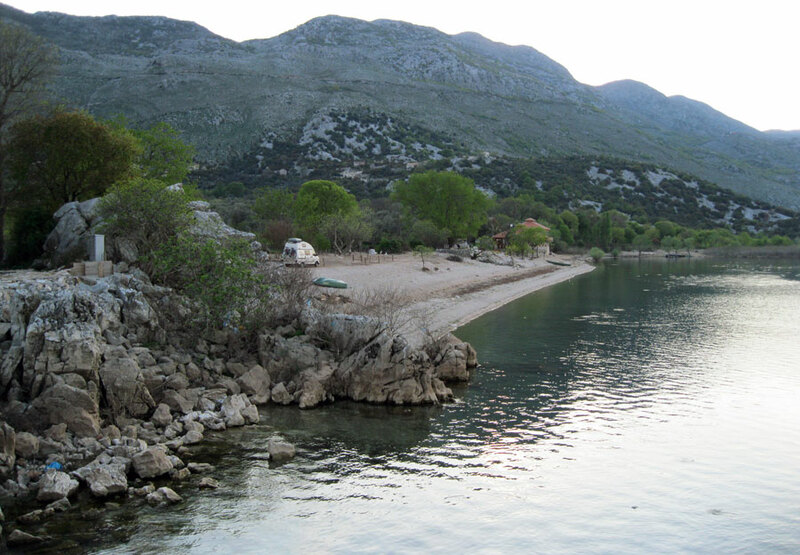 There’s a fairly large Albanian town – Sköder – on the eastern bank of the water, while the Montenegrin part of it is rugged and not easily accessible. We reached the western tip of the lake after about half an hour’s drive. Turning off the main road, we entered the “Skadar National Park” at the town of Virpazar, where we stopped for a very nice lunch. As with a lot of the places that we’ve passed through thus far, it had the feel of a town that must be heaving in July, but is still absolutely empty in April. Beyond Virpazar the road was a one-track, partly tarmacked affair, which (we agreed unanimously, and that’s saying A LOT after a fortnight in Romania) was the single most hair-raising driving experience thus far with Camperissimo. On the left were uninterrupted sheer cliffs, and now and again a chunk of the road was just, well, missing. Our Lonely Planet suggested a town called Murici, halfway along the south shore, with a small resort, beaches, an offshore monastery. It sounded perfect. The road down to Murici was absolute hell in every respect, with donkeys, roosters, enormous gaps in the road surface, absolutely no signs and an occasional branch or two, but it was worth it: the beach was beautiful, deserted, and absolutely and completely silent. We parked the van at the start of the beach and Iva walked along to the house at the other end, where there were also three small holiday bungalows. The owners were very friendly and told her to park wherever. The woman even offered to cook us dinner for a small cost. While this was happening I was approached by an odd looking man walking along the beach from the other direction, who introduced himself as Hassan. To cut a long (and surreal) story short, Hassan owned the central strip of the beach and suggested we move the van 10m and park there. Which we did, and promptly got stuck in the sand. During which time, Hassan’s friend arrived to watch. And then yet another man turned up, but this one with a spade and a useful look in his eyes. 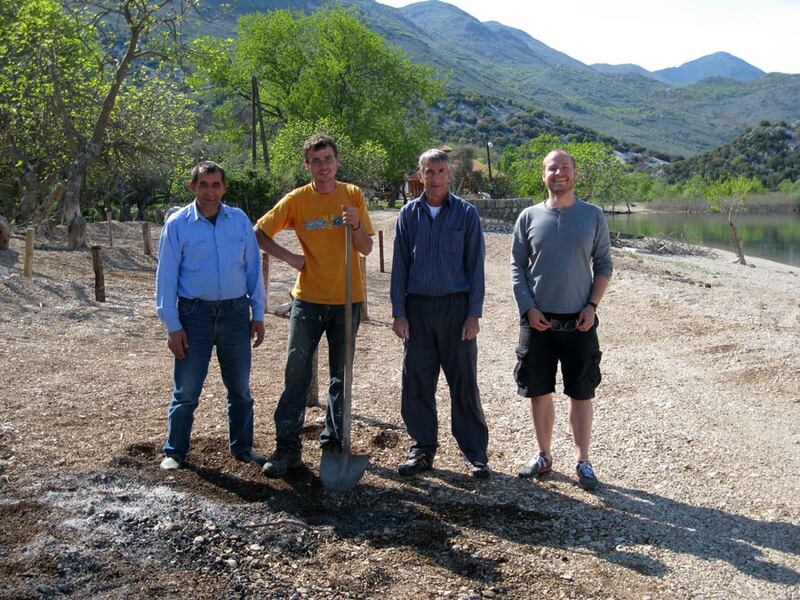 Some digging, some pushing and a quarter of an hour later, and Camperissimo was free again. We opted to park back where we had parked originally and Iva seized the moment and took a photo of me with our three new friends. 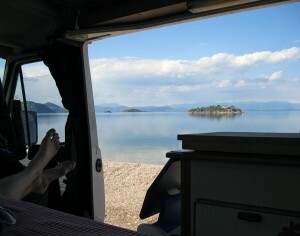 This entry was posted in Camper Trip April 2011 and tagged 2011, beach, crazy roads, lake, Montenegro. Bookmark the permalink.